With a renewed passion and excitement for worship, Martin Smith (Delirious ex-lead singer) launches his solo career with ‘God’s Great Dance Floor’. Hear the fresh creative spark and soak in the devotionally rich lyrics. Love the music of Delirious? Martin Smith former Delirious front man blazes a trail yet again in Christian Worship with his CD 'God's Great Dance Floor'. Bringing us 10 new tracks featuring an up-to-date worship sound, this CD starts a new era in what continues to be an awe inspiring career of service to the worldwide church. Featuring the former Delirious lead singer’s first ever solo EP as the title track, Martin Smith’s ‘God’s Great Dance Floor’ has all the strong drums, top-line guitar work and upward focused worship lyrics expected from a passionate musician able to reach upward and inward. Igniting the creative spark that sets his output apart this is an album of reflection and rediscovery. Over the past year, Martin Smith has led worship events around the world including the US, New Zealand, Singapore, Argentina and Colombia but remains rooted in his local church. With fresh new sounds from around the world, and the experience of his two-decade career with the genre-defining band Delirious, this new album enthuses the Church onto its feet once again and feel alive on God’s great dance floor. God's Great Dance Floor CD by Martin Smith was published by Kingsway in April 2013 and is our 13434th best seller. The ISBN for God's Great Dance Floor CD is 000768519028. Be the first to review God's Great Dance Floor CD! Take a peek at some articles related to God's Great Dance Floor CD. Got a question? No problem! Just click here to ask us about God's Great Dance Floor CD. Having written many of the church's best-loved songs - including I Could Sing of Your Love Forever, Majesty and Did You Feel The Mountains Tremble? - Martin remains rooted in the local church and is back with fresh new sounds. Martin instinctively calls out for people to become a 'voice' for those who do not have a voice. For Martin Smith, endings aren't all they seem. In 2009 he came to the closing stages of a two-decade career spent holding the microphone and cheering on the crowds with the genre-defining band Delirious. With Dove awards, Grammy nominations and RIAA certified gold selling status behind him, it was an incredible journey. Today, what lies ahead is bold, fresh and exciting. Like we said: endings aren't all they seem. “A big part of the story is: OK I let this big thing go called Delirious, but I really enjoyed making music again. We recorded it at the end of the house; got some guys from the local church involved and it was that moment: “Wow I’m going to put some music out and everyone’s going to hear this… There’s definitely more fragility, more vulnerability – I think you can hear that. “I think one person on their own can do great things; but a generation can do extraordinary things… We can’t keep doing church within the walls, we have to bust it down; we got to break it down. This thing should have no walls, no boundaries. “I was really inspired through this whole time by the story of the prodigal and just amazed again how he blew it - he just runs off and spends all of his dad’s money. If that happened to me would I be so welcoming? It doesn’t matter what ever you’ve done Right now you’re just standing with me – You’re my kid and I love. 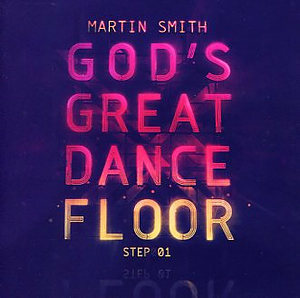 'God's Great Dance Floor - Step 01' is a 10 track collection of songs originally as Martin Smith’s first two solo EPs, plus another two previously unreleased songs. The first song 'Awake My Soul' includes the sound of a glockenspiel replacing the into usually given to other instruments followed by what is in effect a melody-set rap. "Awake my soul be lifted up, be lifted up." Forms the words of the chorus with input from Chris Tomlin, which gets more pace on it as the song progresses. 'Fire Never Sleeps' kicks of with drums and guitars and is familiar to anyone who has Martin’s Jesus Culture in New York album. You might pick up the U2 sound that Delirious also picked up over the years singing out with passion: "Burn oh my soul, set me on fire." Though the tempo changes with the linking, "Purify my heart... Spirit fall on us," turning into a guitar and drum instrumental session. 'Back To The Start' starts out in a simple electronic ballad style: "I'm coming home, back to the start where you found me - I give you my heart again," before lifting off as the song transforms into rapid drums and crashing cymbals, guitar riffs and passionate vocals. 'Waiting Here For You' and the tracks that follow have quieter profile as Martin singing gently to the soft backing track. 'You Carry Me' is a simple low key ballade and 'Safe In Your Arms' is just Martin accompanied an acoustic guitar in gentle, heartfelt and building personal prayer. One of the new songs, 'Jesus Of Nazareth', is in the country mood, with a clap style, rebel yelps, rhythm, strummed guitar and gang vocal chorus of: "I was born to follow You". 'Catch Every Tear Drop' is born from Martin’s car accident at the start of his career with Delirious. "I fell asleep at the wheel,” he confesses, “don't know how I got here. I spun around and lost my way.” Personal and emotional, it’s more than just a reflection: "Catch every tear drop, then will you catch me too." 'Shepherd Boy' closes the album with a basic piano backing to the Chris Tomlin co-athored lyrics, "So come and lay your troubles down, cos love is breaking through." Also on Chris’s 'Burning Lights', this final track leaves the listener on a spiritual high. Now Playing: Awake My Soul Your browser does not support the audio element.